Welcome to the world of WebDataGuru, your one-stop destination for LinkedIn data scraping/extraction. We understand that extracting data and business information from a network as vast as LinkedIn can be a mammoth task. Thus, we bring to you our LinkedIn data extractor services– a remarkable solution that saves your time and efforts from being spent on manually copy/pasting of information for your market research. Web research is considered to be a vital part of marketing intelligence. This will, in turn, give you a comprehensive representation to draft a strategy that will help you strikethe “right chord at the right time”, thereby generously boosting your business to grow. Our LinkedIn data scraper solution helps in leveraging professional information for enhancing your business revenue margins. This excellent service extracts all the important information and data which you need, to give you a complete picture of business scenario of the market, aid in analysis of competitors and help in understanding the consumer psyche. We offer cost-effective solutions to save your efforts and money. 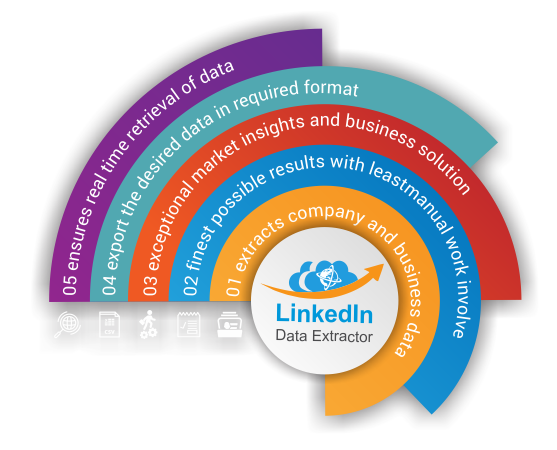 Our LinkedIn data extracting services are result-oriented,offering accurate data extraction for your business. Speedy results is the USP. The job which usually might take multiple days, we complete it in hours. Our focused and intuitive user experience allows even a non-technical person to work seamlessly on the extraction software. Still waiting? No more waiting! Hire Us Today!Get Started Today!